I get it, and I’m with you: it’s Uggs Brady. Again. And watching Bill Belicheat show us how much he doesn’t care — again — is wearing on us all. Patriots Malaise has officially set in. 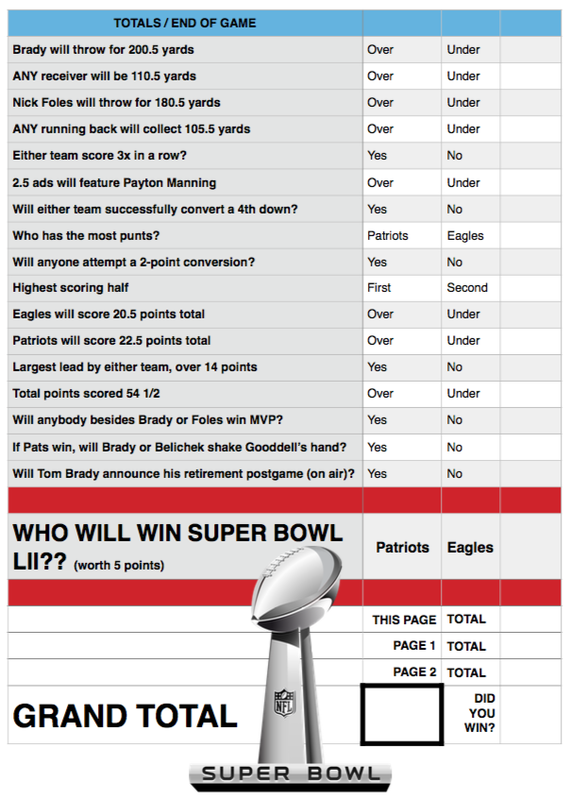 So this Super Bowl matchup leaves something (okay, a little more than something) to be desired. Even a free Timberlake performance just isn’t gonna do it for me. Look, we’ve gotta do better than our existing Super Bowl parties, gang. Those football-shaped foods are a good try, yo, and shushing one another in hopes that we’ll see something truly captivating come commercial time almost always leaves us disappointed. 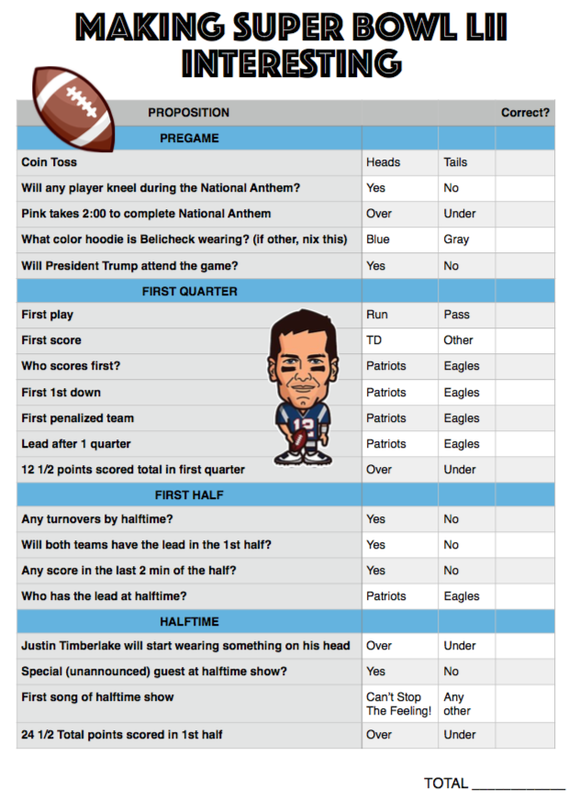 Have your SBLII Viewing Bash guests each bring a $5 or $10 gift card with them to the party (Seriously. Put on a show of Real Haughtiness on this point, and don’t budge: “No gift card, no bean dip” works well). When (and only when) they cough up said gift cards, hand them a printout of The Questionnaire. Then, make sure everybody circles their picks before any of the game-time festivities begin. 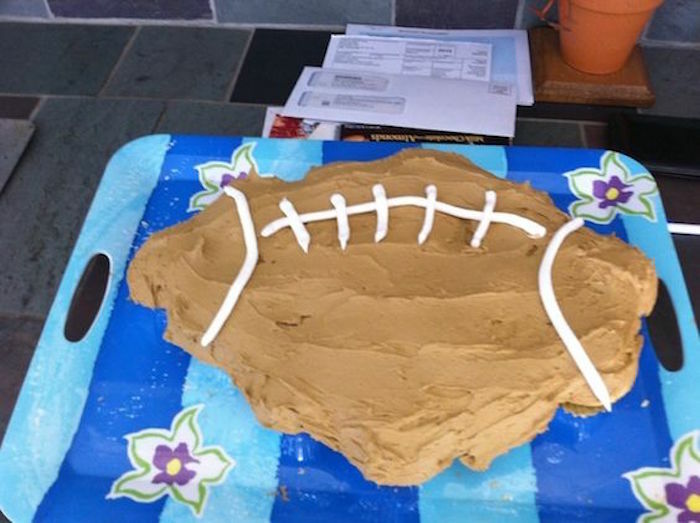 Become a Super Bowl Hosting Legend, eclipsing even The Golden Boy’s near-mythical status. MARK MY WORDS: you and your friends will be FAR more engaged with the (sure to be disappointing) game, have WAY more to talk and scream about… and some lucky stiff will actually leave your party crowing about what a genius he is and how loaded down with gift cards he is! (Maybe even you! …nah, probably not you.) 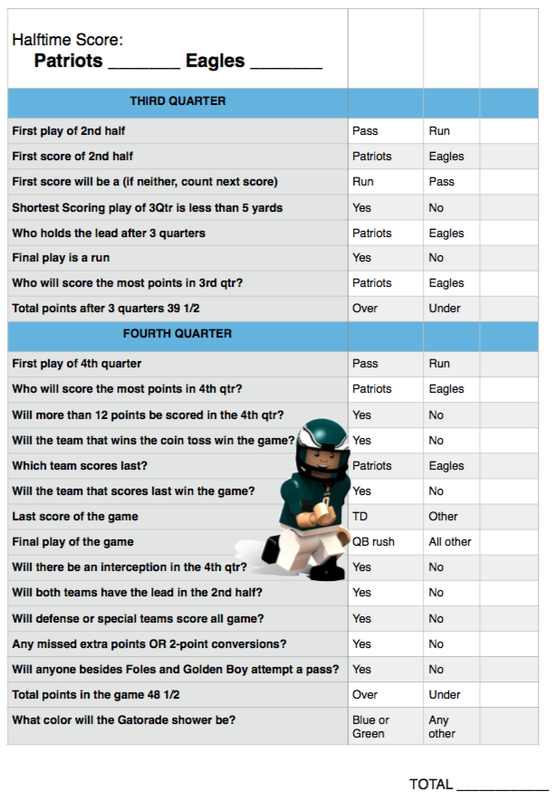 Regardless, play this sweet Super Bowl Props Game — which I made. For you. For free. — and watch the fun begin! You’re welcome America. Now go have a ball you crazy kids!